After a giggle-worthy moment earlier in the week, Sunday's rocket launch was a complete success. 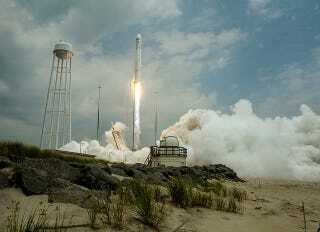 Orbital Sciences Corporation is fulfilling their second cargo delivery mission, Orb-2, carrying food and scientific equipment to the International Space Station. The launch was out of NASA's Wallops Flight Facility, Virginia. Weather permitting, the launch of a massive thirteen-story rocket like Antares is visible along the entire eastern coast. For today's launch, the rocket or its contrail should have been visible in Washington, DC 90 seconds after launch, Philadelphia after 120 seconds, in New York City after 150 seconds, and in Boston after 210 seconds. As it was a daytime launch, for more distant viewers the rocket's glow would be difficult to spot but the contrail should have still been visible. While Vandenberg Airforce Base has the correct orientation to launch payloads into polar orbits, and Cape Canaveral is better for dropping payloads into geosynchronous orbits, Wallops is at the correct inclination to drop payloads into low Earth orbit (LEO). And that means it's the perfect place to send packages to the International Space Station. After a 3-hour countdown with several scheduled holds, the liquid-fueled first stage of the Antares rocket ignited. Two seconds later, the ruthless force of Antares was enough for lift-off. Four minutes into flight, at 63 miles altitude and travelling at 10,118 miles per hour, the main engine cuts off (MECO, pronounced "Meeko"). Moments later, the first stage separates, falling to Earth. Ninety seconds after that, the fairing covering the Cygnus blossoms open, and separates. The solid-fueled second stages ignites and burns for just over two minutes, propelling the craft ever higher and faster. Two minutes after the final booster burns, at 125 miles altitude and 16,835 miles per hour, the Cygenus cargo spacecraft separates from the second stage. At just over 10 minutes from launch, the cargo spacecraft is in preliminary orbit, and unfolds solar arrays to charge up and begins the careful choreography of dancing in close and synchronizing with the International Space Station. Mission operations for the Orb-2 mission is being controlled out of the same room running the OCO-2 satellite. The dance takes some time — after a beautiful launch on Sunday, Cygnus won't actually arrive at the station until early on Wednesday morning. Commander Steve Swanson will grapple it, with Alexander Gerst as his backup (provided he's calmed down after celebrating the World Cup win). The more than 3,293 pounds of supplies was roughly split between goodies for the crew and everything else. Crew supplies including food, provisions, and care packages takes up 1,684 pounds, while EVA equipment takes up a slender 87 pounds. Computer resources (18 pounds) are also on board, with control, data handling, photography, and television equipment. The remainder of the payload is split between science experiments (721 pounds) and vehicle hardware (783 pounds). The science projects are pretty cool, everything from launching more tiny CubeSats to student science projects in space. Back in January, 28 nanosatellites were released, forming the first flock of Dove satellites. On this mission, the second flock will be released to join them. Between them, the satellites will image most of the planet more often that is being done by conventional satellites, hopefully providing more timely imagery for disaster response, and more detailed surveying of land use changes. TechEdSat-4 will be another stage of testing for the Small Payload Quick Return System, a program to quickly and safely return tiny payloads to Earth without waiting for flights on the Dragon or Soyuz capsules. This particular test will experiment with a tension-based drag device (Exo-Brake), and demonstrate fast uplink/downlink control capacities. Finally, 15 student projects are on board, checking out everything from radish roots to farming tadpole shrimp. One project will track yeast fermentation in honey, theoretically to produce alcohol for antiseptic use but in my imagination it's totally the first step towards microgravity moonshine. The spacecraft will stay docked to the International Space Station for approximately one month, before detaching and performing a final mission as an orbital incinerator service. Loaded up with approximately 3,000 pounds of junk, Cygnus will detach on August 15th, disposing of trash during its fiery demise as it returns to Earth.